Most users ever online was 2,276, 26-10-2018 at 12:54 PM. The Navara Forum was formed to allow fellow Navara owners to get together and experience the ownership of one of the best off-road vehicles going around! Our forum allows members to gain knowledge about their Nissan Navara and to exchange ideas. We try to help with any questions, problems and solutions by real people that work with and own all types of Nissan Navaras. We have an atmosphere of friendly people that enjoy their off-road vehicles and want to take it to the next personalized level. We are a social community which enables its members to connect with other Nissan Navara enthusiasts. 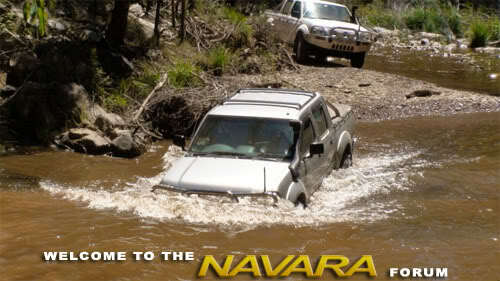 So don't just join another discussion board... Join The Navara Family Today!! We are a fan site...not affiliated with Nissan Motor Co. in any way.. Given someone just died at Summernats from travelling in the back of a ute it's an unfortunate reminder. What once was common and a "bit of a larf" is no longer so. The world has moved on, both for good and bad. BEST PLACE IN THE WORLD! !